In January 2017, the editorial of the 50th anniversary issue of Regional Studies launched – under the title "Global reversal, regional revival?" – a timely debate about regions and their development in a changing world where global trade and capital flows have been challenged. At the same time, The Economist presented evidence of capital flows shifting from foreign direct investments by multinational companies to new and more decentralised strategies such as an increasing focus on the establishment of national franchises, as well as the growing success of SMEs by means of utilizing e-commerce. New models of international business are emerging, and these have evolved in response to changing technologies, political shifts, the territorial awakening of some regions, and changing consumer demands – including calls for a more overt attempt to address sustainability and social justice at the national scale. In this context, we need to better understand the nature and fabric of a footloose world. We know that transport and communication technologies continue to progress, information is ubiquitous and the data deluge is growing over time, while at the same time economically valuable knowledge continues to be sticky. On the one hand production factors remain highly mobile and this mobility is expressed in ways that are often unexpected, while on the other hand a rise of local culture and awareness, and tendencies towards increasing protectionism and nationalism is clearly observable. Nonetheless, migration pressures remain evident both within firms seeking new labour and amongst individuals seeking out a better life, capital investments continue to be borderless and the world of tourism booms. 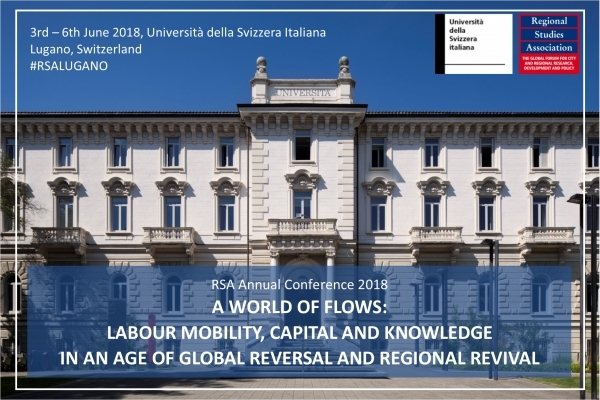 The 2018 RSA Annual Conference aims to address processes of global reversal and regional revival, in a world dominated by flows of capital, labor, and knowledge. Further it seeks to understand the political, economic and social factors that initiate change and how these changes are finding new expressions as the world’s political and economic system continues to struggle with low rates of global economic growth, the rise of China as an economic super power, the on-going impacts of recession and austerity, and increasing levels of inequality. To study and debate these and many other questions, we warmly invite the regional studies/science and connected communities to join us at the 2018 RSA Annual Conference in Lugano, Switzerland. Please submit proposals for papers in the form of a 250-word abstract (text only) through the RSA conference portal by Friday 23rd February 2018. Proposals will be considered by the Conference Programme Committee against the criteria of originality, interest and subject balance.